Ten years ago, mixed martial arts (MMA) was literally unheard of in Africa. Today, there is a thriving MMA community in the African continent and a number of MMA training schools that are grooming youngsters in becoming the next MMA African star. The Ultimate Fighting Championship (UFC) is the biggest MMA organization in the world and has a stable of some of the best MMA fighters in the world. During the last few years, a number of top African fighters have emerged to dominate different weight-classes in the UFC and make a name for themselves. Francis Ngannou is by far the biggest UFC superstar who fought for the heavyweight championship earlier this year and lost. Ngannou who was born in Cameroon now lives in the United States and travels often to his homeland to give back to his community and encourage a young MMA community. Some of the other top African fighters include Kamaru Usman who is amongst the top 3 contenders in the UFC’s welterweight division, Israel Adesanya who recently joined the UFC and has quickly established himself as a top talent. These African fighters always remember their roots and often speak in their local language to reach out to their growing fan base across the African continent. Kamaru Usman is one African fighter who is pushing for the UFC to stage an event in Africa. He says the image that Africa is poor and there is not much of interest in MMA in the African continent is wrong. Usman pointed out that it was very possible for the UFC to fill out a stadium in Africa given the quality of African talent on display. 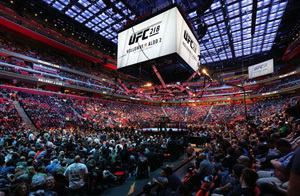 The UFC does not have any plans of hosting a UFC Africa event in 2018 but given the fact that there is a strong stable of African fighters coming through, it will not be long before the UFC packs out a stadium in Africa and further boosts the popularity of MMA in Africa.